The three tenders were opened on Tuesday in the official public procurement website APP.gov.al and according to the accompanying documents, the works will last for 24 months for the construction of three multi-level overpasses, the biggest being expected to be the overpass at the well-known place "Shqiponja". All the three projects are aimed at facilitating the traffic in this segment of the Great Ring Road and the speed of exit and entry into Tirana from the Tirana-Durres highway. This is also one of the most expensive road sections Albania has ever built. The first tender has a limit fund of 2.25 billion leks and ARA says the government has planned to carry out this spending in the mid-term budget plan 2018-2020. The new node to be built will have three levels. A subway will be extended in the direction of Dritan Hoxha Street, avoiding the roundabout for vehicles leaving for the exit from Tirana on the highway. 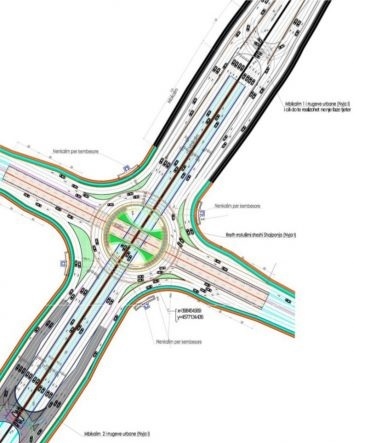 An overpass will serve to link the Teodor Keko road with the next segment of the ring, which will connect the Shqiponja with the "New Boulevard" but still in the design stage, while the current level of the road will serve to turnaround. In the tender documents this is known as "Lot1 1". Loti 2 at a cost of about 1.6 billion leks or EUR 12.5 million includes the expansion of the Lane Bridge with two underpasses to connect the existing neighborhood lanes on both sides of the Ring Road and a further underpass. Lana Bridge at the point where Lana goes down The new ring is expected to expand to 70 meters. Lot 3 at a cost of about 1.2 billion leks intends to make two lanes the connection of the Kavaja Street with the New Ring. The Albanian government has approved hundreds of thousands of euro worth of projects for construction or road improvement, as it has faced criticism of the deadlock of major construction projects of recent years, such as the Tirana-Elbasan highway, Fier or Vlora bypass, and endless crawl of works on segments launched a decade ago, such as Milot's Knot or Lin-Pogradec segment. The preferred method of government for road construction are highly criticized concession contracts, in which money is paid in installments for 13 years. The International Monetary Fund has repeatedly criticized this practice as too costly and an increase in public debt secretly. The government has opened races or closed contracts for some road segments in which around 710m euros will be spent to build about 100km of roads. On the other hand, the US State Department has specifically criticized the way of procurement, in which there appears to be no real race and foreign companies are excluded from the procedures. There has also been criticism of the phenomenon of incredible inflation on road costs. Currently a kilometer of highway costs over 12 million euros while a two-lane interurban road costs over 4 million euros. The government has spent officially hundreds of millions of euros in recent years for road construction, but roads have not been built. During 2017, the road construction fund was 20 billion leks, while a total of 10 kilometers of roads were built, according to the report of the Ministry of Transport and Infrastructure. While until now there is no an independent study of how many dollars the Albanian officials may have stolen, having in mind that in all international reports the corruption in Albania is at very high levels.